The Vango Zetes 200 repeated again this season after a stunning debut in 2009. 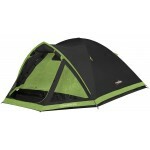 So simple to pitch these tents are positively brilliant (Stan's school report). The Zetes simply features 2 Powerflex fibreglass poles to form a simple tunnel structure but with a Tardis like amount of space inside. 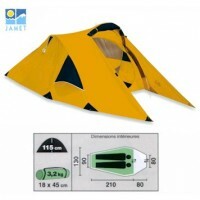 The other real beauty of this tent is the all-in-one pitching option and the pre-attached guying system which means once the poles are threaded, pitching is a breeze. 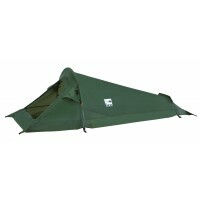 Key features of these tents include, a 2-berth breathable fabric inner with 10,000mm HH polyester bathtub groundsheet, a front porch area with pre-attached groundsheet, a Protex 2000 polyester fabric flysheet with 2000mm hydrostatic head protection and fully taped seams, heavy duty pole sleeves, ring and pin pitching, 'O' ring pre-attached guylines, parallel zip door, mesh vents, 'crystal clear' windows with internal covers for privacy. Comes complete with zip entry handled carry bag and repair kit. 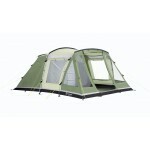 Vango Zetes 200 Tunnel Tent - 2010 Model .